Included in the box, you will find the MW07 earphones tucked away in their case, as well as a variety of different-sized earpieces for nailing the perfect fit. Master and Dynamic included a carrying bag and a charging cable too. The cable is USB-C to USB-C, and they've even opted to include a USB-C to USB-A adapter, which is the best case scenario. It embraces the future, but still affords users the ability to power up with legacy power adapters. When fitting the earbuds to your ears, there are two different parts that can be adjusted independently of one another. The actual tip that goes into the ear canal and the "fit wing". Both parts are made of super soft silicone and come in different sizes. I'll admit that I shy away from earbuds that go in my ear as they can become uncomfortable over long listening sessions. With the MW07, I was able to go a bit smaller with the tip, largely relying on the fit wing to keep the buds in my head. This yielded an excellent fit that stayed in place and was comfortable hours on end. There is no other way to put it. The MW07 earphones blew us away in their build quality. It starts with the stainless steel charging case. This case has a beautiful glossy finish with a subtle engraved Master and Dynamic logo on the top. On the rear is the USB-C port (which again, kudos on choosing USB-C over micro USB). A trio of LEDs reside on the front. These LEDs give you a heads up about the power situation of the individual earbuds. With the earphones in place, when the case is closed all three lights will briefly flash amber, before showing the power status of each earphone and the case itself. If they are fully charged, it will go green. If they are in need of charge, they go amber. When plugged into power, the center LED will emit a red hue. Moving past the case and on to the earphones themselves. Each of the earphones is made of metal, with the aforementioned silicone tips, and a handcrafted acetate exterior. Acetate is a super lightweight and fashionable material often seen in high-end glasses and sunglasses. They give the MW07 a unique look we've never seen in a pair of earphones -- and we love it. On top of the left earphone is a set of buttons able to adjust the volume during playback. On the right, we have a solo button for controlling playback or answering a call. Like much of the rest of the hardware, all the buttons are metal and have a matte black finish. Aside from the exterior quality, internally there is a lot going on. All lending itself to the premium sounding audio. Within each earphone is a custom 10mm beryllium driver. Beryllium is very lightweight, but rigid, able to create rich sound while cutting back on distortion. It can be pricey, which is why many headphone makers don't utilize it. Master and Dynamic chose Bluetooth 4.2 to connect to your device and near-field magnetic induction between the earphones. In our day-to-day testing, we never had any issues with one earphone or the other cutting out, a testament to the NFMI connection. They also support AptX (though the iPhone still doesn't) and AAC for playback. We ran through our usual testing playlist with the MW07, designed to push the earphones to their limits encompassing several different genres and musical nuances. The Cars Moving in Stereo is an experience. Sound reproduction is pretty spot on during this iconic song. Stereo during the intro is eerie at how good it sounds with quite a bit of sound isolation on the non-active ear, especially with no noise cancellation. One of our favorite songs to test with is Queen's Bohemian Rhapsody. It is such an eclectic song with guitar solos, heavy bass hits, high pitched operatic sections, and more. It does a great job pushing the headphones to the limits and shows their strengths. A high point for the MW07s is right before the tempo increase during one of many guitar solos. The subsequent operatic section also was a pleasure to listen to. With so much going on, weaker headphones often really crush the details in a busy song like this. In some of my earlier testing songs, I started to feel a bit underwhelmed when it came to the bass output but that changes as I went into Joe Cocker's Come Together. The bass was prominent, but still had the definition of expect out of higher-end headphones. Even some high-end headphones that tend to lean towards the bass-heavy side can often lose definition in the bass on this song as they just try to push more out. During Queen's Somebody to Love, it was great to hear near silence on the non-active ear as chants of "oh yeah" go across the soundstage. Freddy Mercury's trademark falsetto cut through loud and clear and is hard to get chills as this remastered song comes to a high point as everyone joins in singing "somebody to love". We also took several calls with the MW07 and the recipients on the other end reported clear audio, without even knowing we were talking on a pair of earbuds. 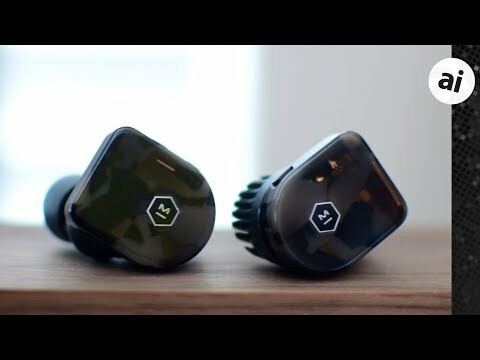 To be as exhaustive as possible, we tested out the MW07 truly wireless earbuds in a variety of different situations. From vigorous workouts, to open-window car rides we tried all the different scenarios for these earphones. We will overwhelmingly pleased by the performance, especially the audio quality. They also seemed to draw attention, especially when people at the gym saw us pull out the glossy stainless steel case. Everyone who saw them instantly was taken by them and wanted to know more. While we spent some time taking phone calls on the MW07, we weren't huge fans. The calls sounded great, but there is such a degree of sound isolation, we couldn't hear ourselves talking. AirPods fit so loosely, it is easy to hear yourself. Taking a call on the MW07 was like talking with your fingers in your ears, and we were self-conscious we were talking far too long. Battery life was pretty great, easily getting three and a half hours of listening on a single charge. The case will provide two additional charges, which should be about enough to get us through a weekend without having to charge up again. The more miles we put on the MW07, the more minor squabbles we noticed -- emphasis on minor. Two concerns deal with the case itself. When the case is opened, there is nothing that keeps the case open and it has a tendency to easily fall back close. In the closed position, there is a magnet to keep it shut, but there is no tension whatsoever when opened. Alongside that, there is no magnet that keeps the earphones in place within the case. 95-percent of the time this is a non-issue. But once or twice when we had already started a workout before putting my earphones in, the shaking of my hand as I ran made the individual earpieces bounce a bit in the case and was enough to make us worry. Our last squabble is using one earbud at a time. Using one is a great way to listen to music or take a call, while still staying aware of the world around you. We do this frequently and was something we tested quickly with the MW07. If the right earbud is used, there is no issue and it can be used solo. However, if you want to use the left earbud alone, it won't work. Seems the right earbud is the master earbud and is the one that connects to the device over Bluetooth, and to the left earbud over NFMI. Without the right earbud, the left is useless. There are lots of aspects to compare between AirPods and the MW07 truly wireless earphones. They both have the same function, though they go at it in vastly different ways with very different results. We've been unabashed fans of AirPods since the beginning, but the MW07 may be the first wireless earphones to make us give them up. MW07 wins hands down when it comes to the build quality, audio quality, case design, and fashion-appeal. However, AirPods have a big edge that no one else has yet to beat out -- Apple's W1 chip. This custom wireless silicon provides amazing range (up to 100 feet) and class 1 Bluetooth audio for more robust signal strength. The MW07 are still capable of around 60 feet of range, but that is still less than AirPods. AirPods also have the ability to easily jump around to any device on a user's iCloud account. Pair them with your iPhone, and iCloud syncs the Bluetooth profile to your Mac, iPad, Apple Watch, and Apple TV. You can keep them in your ears and move between your devices as you please. MW07 does have larger single-session battery capacity, but the case only extends the listening time to 14 hours total, where AirPods can get up to 24. Simply put, AirPods aren't really direct competition for the MW07 truly wireless earphones. AirPods are super convenient, surprisingly affordable, and have good sound for the price. But the MW07 are in a league above with a keen eye for materials and the best sound quality they can muster. We've said it once and we will say it again, AirPods are amazing. They are one of our all-time favorite Apple products and Apple nailed it. They split the difference between audio quality and price. But some want more. After listening to the MW07 for the past few weeks, it is hard to go back to AirPods because the sound seems night and day. Master and Dynamic nailed the quality of the case, the earphones themselves, and the handcrafted acetate gives a unique look we are sure many will love. Master and Dynamic's MW07 truly wireless earphones are available now to order in four different colors -- tortoiseshell, grey terrazzo, matte black, and steel blue acetate -- for $299. I wonder if Apple could do a more upscale version of AirPods that has everything we love about AirPods but focused more on audio performance and fashion? Maybe even Beats branded. AirBeats. The reviewed product in this article is 2X the cost of AirPods so it seems like there is a lot of headroom available for Apple to drive in some crazy innovation. They spec nice. But are they really 'more than double the quality' of AirPods? Because at that price, that's what I would be expecting. As an aside; I am that there was no AirPod "2" announcement yesterday. AirPod is a better choice. And don't forget to pay for AppleCare! Fashion appeal? The case looks good, but the AirPods case is all about use. Likewise the AirPods. I never wanted them until I tried them. Thereafter never want to be without them. Amazing they are. These don't even look closer. The other advantage of one at a time use is indeed phone use. One can always be charged. No loss of use. I think you have overrated them personally. When the uninitiated tell me the APs are expensive, I have to explain why they aren't, really. This makes it easier. With audio quality, that ratio never holds. Especially as you go into higher price points. Minimal improvements cost much, much more. Some people pay for it, most don't. Personally, I've never liked earphones that used that kind of tip at the end. Apple used that design for awhile on their more expensive earphones and I'm glad they dropped it in favor of the shape used with the initial EarPods and then the AirPods. A "squabble" is a fight or tussle. A "quibble" is a minor complaint. The article's comment about the noise isolation of these buds making phone calls more difficult dissuades me from considering them. I prefer to listen to music on speakers unless I am traveling, which isn't too often, but I like earbuds for calling even around home. Nice article, but I have one quibble (minor complaint) with the use of the word squabble (argument, as between children).